Magicard have been in the identification business for over 20 years and specialise in producing ID card printers which are secure yet easy to use. Magicard printers offer a wide range of unique features including HoloKote - this is an anti-copying watermark which can be printed across the entire card surface. When the card is tilted, the HoloKote watermark provides visual authentication resulting in secure ID cards with no fake ID cards coming your way. With no additional cost involved when printing HoloKote cards Magicard printers are a great solution for purchasing affordable, yet secure ID cards. Currently, Magicard have a range of printers such as the Magicard Pronto, Magicard Enduro and Magicard Rio Pro. If you would like to know more about Magicard or their models of plastic card printer feel free to contact our team on 0333 7000 123 or email enquiries@lesar.co.uk for all other ID card printers click here. 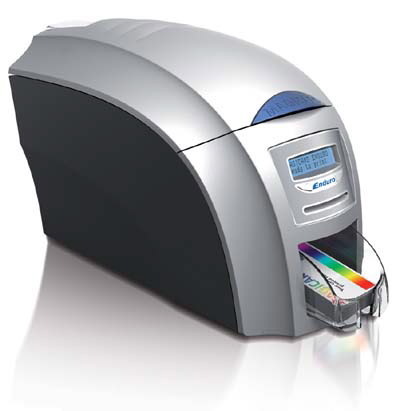 Magicard Enduro provides a wide range of unique features, including the option to print both single/double sided ID cards. Endro's flexibility enables you to print low to high batches of ID cards whilst consistently producing high durability ID cards.